Drain the tofu and mash it, or crumble by hand. Heat the oil and sauté the vegetables until soft. 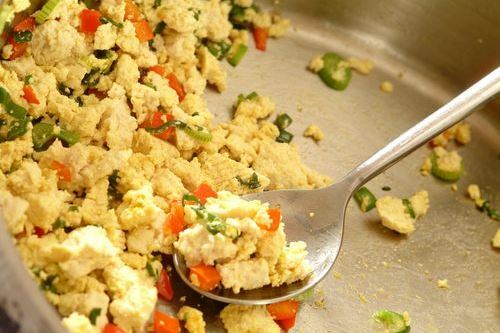 Add the crumbled tofu and sufficient turmeric to give an attractive colour. Season with shoyu and pepper to taste. Serve hot, piled on thick granary toast. Yummy! Copyright © The Vegetarian Society 1993.